We don’t believe that glass is just for walls, windows, and doors anymore. In fact we, we offer a variety of glass furniture tops for dining tables, end tables, dressers, night stands, office desks, counter tops, or really anywhere you would like to add that special touch. Adding a sheet of glass not only protects the surface against spills, scratches, and heat, but also adds a touch of elegance to your space. Custom sizes and shapes with a variety of factory edge work, tints, patterns, and desired thickness are available. Replacing existing furniture tops with a new glass of a different color or depth will give that piece a renewed look. 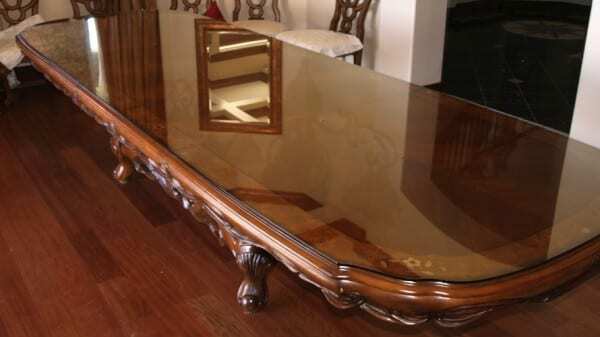 For example, if you have a coffee table from the 90’s with the brown tinted glass and beveled edges, try refinishing the table itself and replacing the glass with clear or patterned glass panels. Whether you have the exact measurements or need to make a pattern, stop in and we can supply you with the necessary materials to do so. Our technicians are glass pros and when it comes to glass furniture tops they are quick to react with measuring and asking questions to get all the details necessary for the perfect cut.